Seven years after buying The Weather Channel, NBCUniversal and its private equity partners are getting more serious about possibly cashing out. Two banks, Morgan Stanley and PJT Partners, are working with the channel's owners and talking with potential buyers, according to two people with knowledge of the matter, who confirmed a Bloomberg report about the sale talks. The people said there was no sign of an imminent deal. 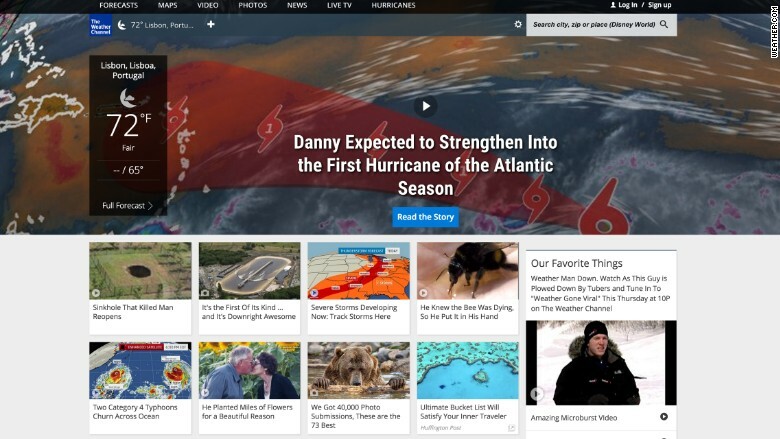 The Weather Company, which owns the cable channel, several web sites like Weather.com, and forecast-focused businesses, is jointly owned by NBC, Bain Capital and Blackstone Group. The partners bought it from Landmark Communications in 2008. They reportedly began to contemplate a sale last year. The sale price was around $3.5 billion in 2008, and the company is believed to be worth somewhat less today. Bloomberg reported that the owners value the various businesses at "more than $3 billion today, with most of that tied to the digital operations." In other words, Weather.com and the company's other web sites -- like the Weather Underground -- are worth more than the cable channel that it was built upon. One of the people who spoke with CNNMoney confirmed on condition of anonymity that the digital assets are seen as the biggest prize to potential suitors. The company says its sites reach upwards of 100 million visitors each month. The Weather Channel doesn't reach nearly as many viewers on television. While it's available in almost 100 million households in the United States, the channel's ratings are usually low. On Tuesday, for example, a typically quiet day, the channel only rose about the 200,000-viewer mark once. The ratings soar, however, during periods of breaking weather news. The channel could wind up being split off from the company's web sites or data products. A spokeswoman for The Weather Company declined to comment Wednesday evening.